The nomenclature of the wine world can be confusing. Many times the words on a wine list are hard to pronounce and totally foreign – leaving prospective drinkers grasping at any word on the page that jumps out as familiar. There are better ways to order wine than to order the one that’s easiest to say or most recognizable. 3. Many Italian wines are listed as Rosso di ____ . “Rosso di” roughly translates to “red wine of…” and that blank is usually filled in with the name of a nearby town or area but is not distinct enough to be a DOC all on its own or is located within a better-known DOC. 4. Sometimes, the names of the wines don’t have much to do with either and don’t worry – I’ll cover those as well. Nobile di Montepulciano, and most Super Tuscans. However, Sangiovese can be billed on its own and often appears under its grape-name when it is produced in Emilia-Romagna or Lombardia. Schiapettino is a grape grown in Friuli-Venizia and produces a medium-bodied wine with notes of raspberries, white pepper, and violets. Friulano is a grape grown in the Friuli-Veneto region . Valpolicella is produced from grapes grown within the Veneto region. Valpolicella is made from a blend of three varieties of grapes that are relatively obscure outside of this region and grown specifically for Valpolicella. The wine can range from light and fragrant table wines to full-bodied and big. Chianti is produced from Sangiovese grapes grown in a specific area of Tuscany. 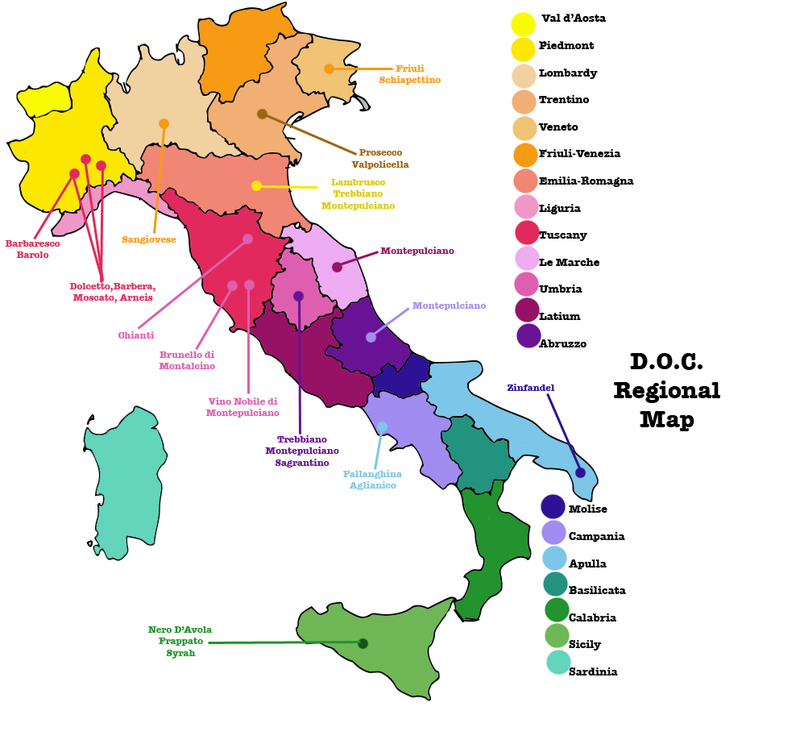 • Chianti Classico is produced in an area that stretches between Florence to the North and Sienna to the South. These wines are usually medium-bodied, have some medium tannins, and have a lighter flavor profile of cherries and florals. • Chianti Rufina is produced in the northeastern area of Tuscany around the town of Rufina and are most widely known outside of Italy as wines with a great deal of complexity and finesse. Rosso Orvieto is a wine produced in the Orvieto region of Umbria and is usually made up of Trebbiano-based blends for whites and Montepulciano on its own or blended for reds. Veneto Bianco is white wine produced in the Veneto region . Vino Nobile di Montepulciano is a wine named after the village of Montepulciano in Tuscany where it is produced. It is made from Sangiovese grapes and is a sub-style of Chianti. Barbaresco is a wine made from the Nebbiolo grape grown in Piemonte in an area called the Langhe. Barbaresco is a big wine that requires 2 years of aging before it can even be bottled, and then is expected to age for another 5-10 years after that. Barbaresco is extremely tannic when young, but softens into a gorgeous red wine known for its floral nose, and rich earthy flavor with tendencies towards smoke, leather, and tar. Barolo is a wine also made from the Nebbiolo grape grown in Piemont. The difference between Barbaresco and Barolo is the area in which it is grown and the fact that grapes going into Barolo are harvested after the grapes that go into Barbaresco. Super Tuscan is a wine that is made from grapes grown in the Chianti region of Tuscany but strays from classification of Chianti because of the proportions of grapes other than Sangiovese that go into the blends. Usually, Super Tuscans, incorporate more Cabernet Sauvignon and Merlot, into their blends to produce a wine that is richer than Chianti. Brunello di Montalcino is a red wine made from Sangiovese grapes grown around the village of Montalcino. Brunello di Montalcino is a wine renowned for its full body, smooth tannins, and bright berry flavors that are often complimented with notes of chocolate or leather. Thank you for all of the very helpful information! Now, onto France?